Cooking soup has become an almost daily affair for me ever since my kids were very young. Yes it has been THAT long. Having a picky eater child really puts a parent to the test on trying out different recipes or just ways of getting nutritious meals into that small body. And some how boiling a pot of wholesome soup usually does the trick. This child of mine would have plain rice and soup for her dinner no problem, even if it means every night. You would think by now I have tried out thousand of soup recipes! Haha unfortunately, we all know that once we are comfortable with just a handful of good ones, we are just contented. I do try to look for new soup recipes even till this day. Because my readers will know my 两菜一汤 menu every night on my IG account, 不可以少了那碗汤！But because I personally feel that some of those soup is so common, it is really not worth mentioning it here on the blog haha! But today, this particular soup I am writing is somewhat like an old treasure I found after many years. A recipe which I grew up eating and yet haven't had the time to replicate it. 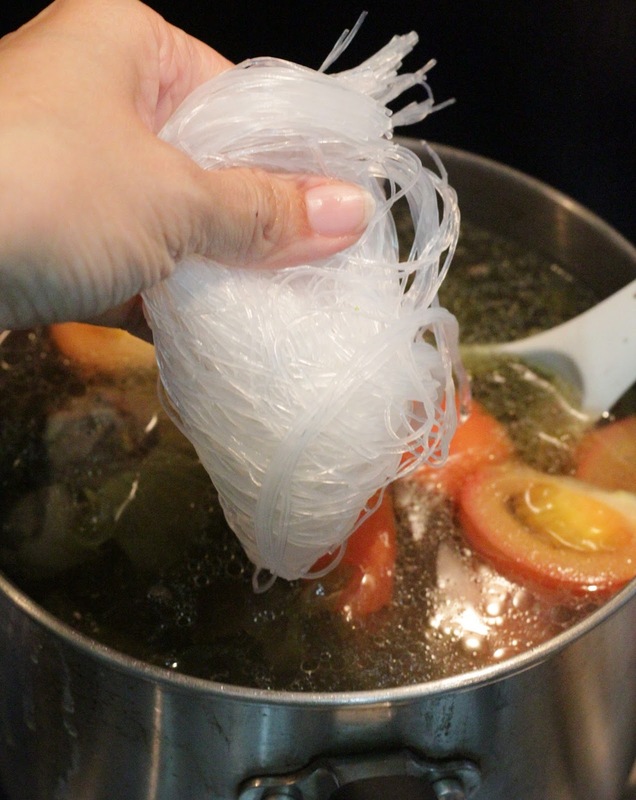 After reading up several recipes and watching countless youtube videos, I have concluded my very own recipe for this Salted vegetables with duck and vermicelli soup, 咸菜鸭汤加冬粉. This is such an old school recipe, I am sure many of you must have drink this before. Personally I love that distinct tanginess of the soup which the cured vegetables gives it. It should be a starter dish if you ask me, sure to whet anyone's appetite! The saltiness from the cured vegetables also cuts into the greasiness of the duck fat, so drinking a big bowl will not make you feel too "Ger-lat". I added fresh tomato slices and vermicelli to make it a heartier soup. The family had this and they love it. Perhaps its due to the fact that I added less salted vegetables, so it is not overly sour and sweetness from the duck meat can permeate through better. 200 g salted vegetables aka Giam Cai, sliced into smaller pieces and some of its soaking liquid if desired. Bring a pot of water to a boil. 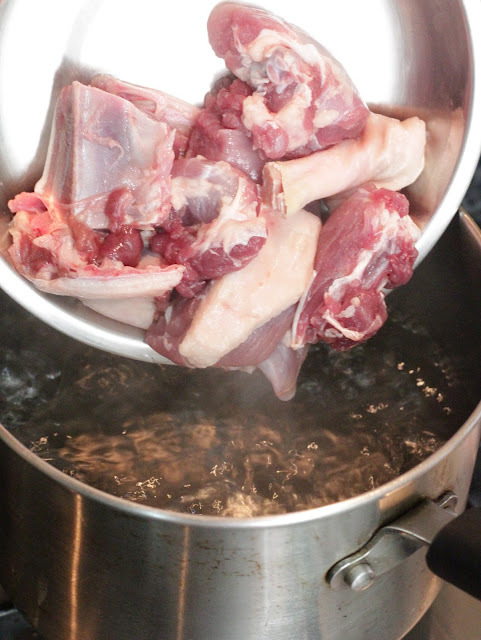 Then carefully place the chopped duck pieces in and par boil for a minute. Drain and fill with a fresh pot of water, add in the ginger slices and bring to a boil again. 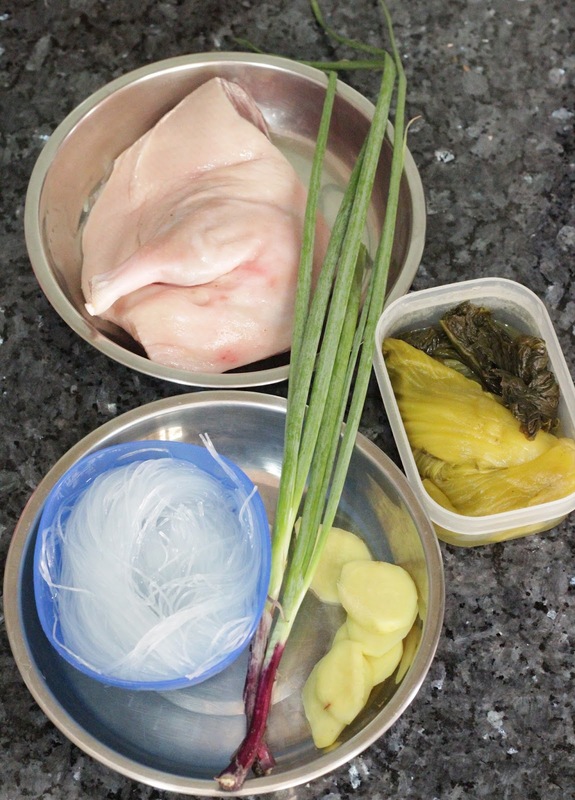 After 10 minutes, you can spoon out any fat or impurities that surface on the soup. Now add in the slices salted vegetables. You can choose to rinse away the salty water that is packed in the vegetables or you can reserve some to be added in to the soup. I added about 2 tbsp worth. 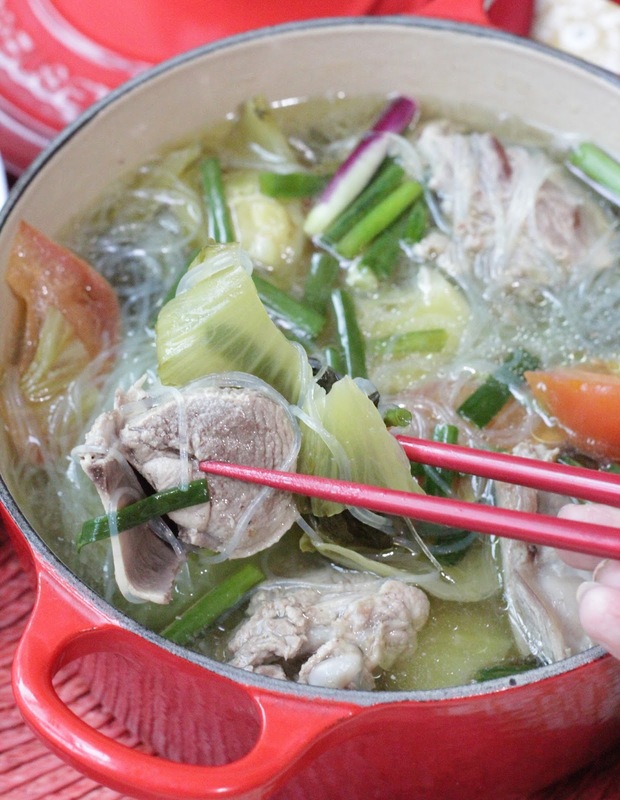 Continue to boil the mixture for another 5-6 minutes till the duck meat is tender and the salted vegetables are soft. Finally add in the tomato slices and the vermicelli noodles. Let the mixture simmer for another 3-4 minutes, add your seasoning and remove from fire. And it is ready to be served! A pot of wholesome goodness! Okay, maybe not that wholesome but it is definitely worth my calories. 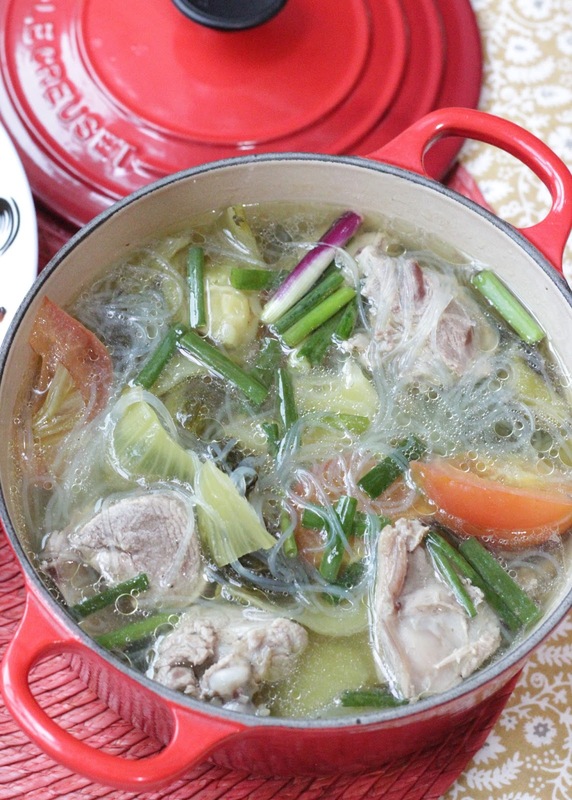 The next time I make this soup again would be to add another duck drumstick to add more flavour. And you notice I didn't even add much seasoning except for that sugar, to counter balance the sourness (in case my family can't take the tanginess haha). Do give this recipe a try and let me know how you like this version. Have fun! I miss those salted veggies! They are so appetizing.